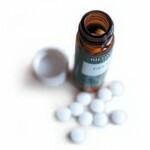 How do I take Homeopathic Medicine? Homeopathic medicines can come in many forms. The most common forms are tablets, globules and liquid. Unless otherwise stated most remedies are taken orally. Tablets or globules are usually tipped into the lid of the container, then tipped into your mouth and placed under your tongue to let them dissolve. No water is required, and you are generally advised to refrain from eating or drinking for at least 15 minutes before or after taking a remedy.